PARK CITY, Utah – Women’s ski jumping will be highlighted in the third annual Governor's State of Sport Awards on April 22, hosted by the Utah Sports Commission and presented by Zions Bank. The first-ever U.S. Olympic Team Trials for women’s ski jumping is nominated as “Event of the Year” and Sarah Hendrickson, of Park City, is nominated as “Pro/Olympian Female Athlete of the Year”. Alissa Johnson, Jessica Jerome and Lindsey Van at the Olympic Team Trials for Ski Jumping on Dec. 29 at Utah Olympic Park. The Dec. 29 Olympic Trials at Utah Olympic Park saw crowds that neared 8,000, while countless more watched via live television on NBC. The event highlighted the U.S. team’s success in achieving Olympic status after an inspiring and decade-long international push. Women competed in ski jumping for the first time in Olympic history at the 2014 Sochi Games. 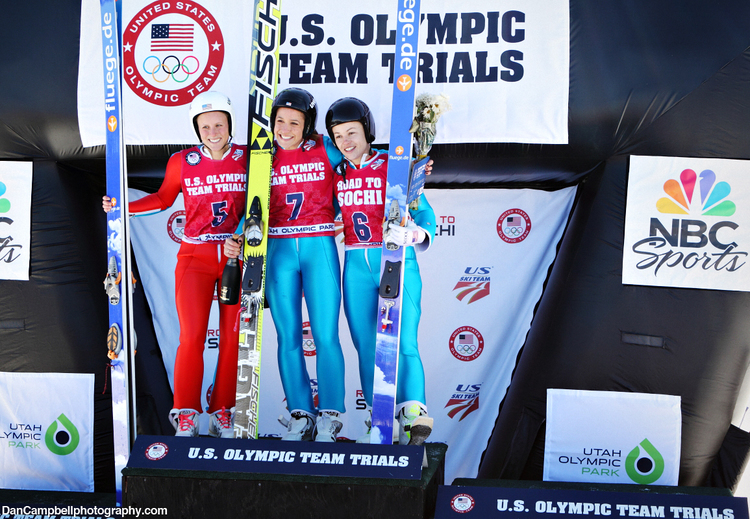 Women’s Ski Jumping USA team members who participated in the Olympic Trials include Jessica Jerome, who won the inaugural event, 2009 World Champion Lindsey Van, Alissa Johnson, Abby Hughes, Nina Lussi, Nita Englund and Emilee Anderson. Utah sports fans have the opportunity to vote for their favorite athletes, coach, team, play and event as part of the Governor's State of Sport Awards. The event recognizes key sports people and partners who have been instrumental in helping to build Utah's sports industry. Hendrickson was nominated as Pro/Olympian Female Athlete of the Year for her 2013 World Championship win in Val di Fiemme, Italy, and for her great comeback to make the 2014 Olympic Team after a devastating knee injury last August. Utah Gov. Gary R. Herbert will provide remarks and present awards along with golf legend, designer and philanthropist Jack Nicklaus, who will be speaking to those in attendance at the awards dinner on Tuesday, April 22, from 7 - 9:30 p.m., at EnergySolutions Arena. The 10 category awards will be based on the 2013 calendar year achievements and include High School Female Athlete, High School Male Athlete, Collegiate Female Athlete, Collegiate Male Athlete, Pro/Olympian Female Athlete, Pro/Olympian Male Athlete, Team of the Year, Highlight of the Year, Game or Event of the Year and Coach of the Year. The nominees were selected by a committee comprised of members of the sports media and the community at large. In addition, a Lifetime Achievement in Sport award will be presented to two other golf legends, Johnny Miller and Billy Casper, for their contribution to sport in Utah. And a special homecoming tribute will honor Utah's Olympians and Paralympians for their impact on the Sochi Winter Games.